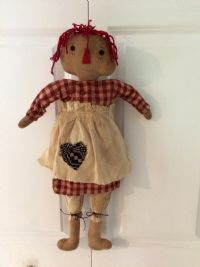 This Raggedy Ann Doll is so sweet! She is wearing a red check homespun dress with a muslin apron and bloomers. A blue coverlet heart sewn on her apron. Hangs 23"